"As God is my witness, I can GET YOU FINANCED!" Now that Andy Rooney has passed away, it’s my turn to talk about what annoys me most. In the commercial real estate industry, I am annoyed by real estate scumbags-turned-saints. 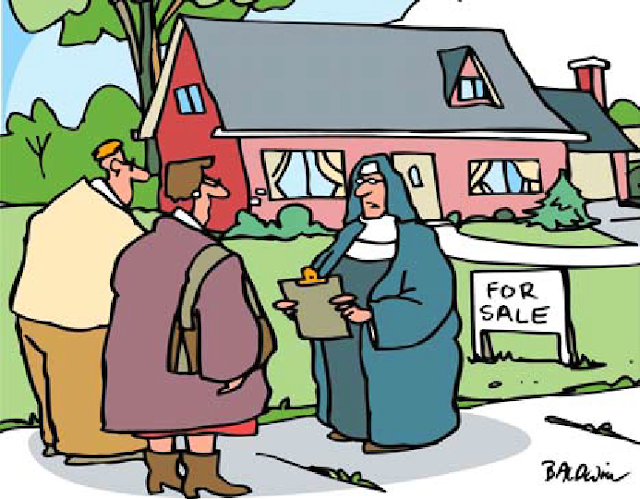 Now we all know that the real estate industry does not naturally attract saints. It may attract sincere people, but mostly people who just sincerely want to become rich. Sometimes, when a convicted fraudster, perhaps a mortgage broker, is led from court in handcuffs, he or she may say, “But I was making the dream of homeownership a reality for underprivileged families!” in a tone of voice so sanctimonious as to make one wonder why Mother Theresa herself wasn’t a mortgage broker, too, until one considers that people with bad credit who lie about income and assets might not actually deserve homeownership. Those people who must announce their integrity! Two weeks ago I received a comment on my Costa Rican tree farm scams post which basically said that my comments did not apply to a company named Ethical Forestry, which owns teak farms in Costa Rica and uses telemarketers to lure UK citizens to invest in trees. If the proof of integrity is in the name of the company, this gives me an idea to create The Ethical Bridge Company. The company’s purpose will be to ethically sell the Brooklyn Bridge, not like all those other Brooklyn Bridge salesmen who give bridgeselling a bad name. 10% of your purchase money will be used to buy wheelchairs for crippled orphans. It may be no coincidence, too, that the only client who ever cheated me out of my fee proclaimed his Christianity in every conversation we had. Have a blessed day in Hell, Mr. Scott. A developer once deceived my bank into making a $30 million land speculation loan at a 5% interest rate and 97% loan-to-value ratio. The loan was allegedly for the purpose of constructing a surface parking lot supposedly worth $65 million, according to their appraiser (but had just been bought for $24,375,000). 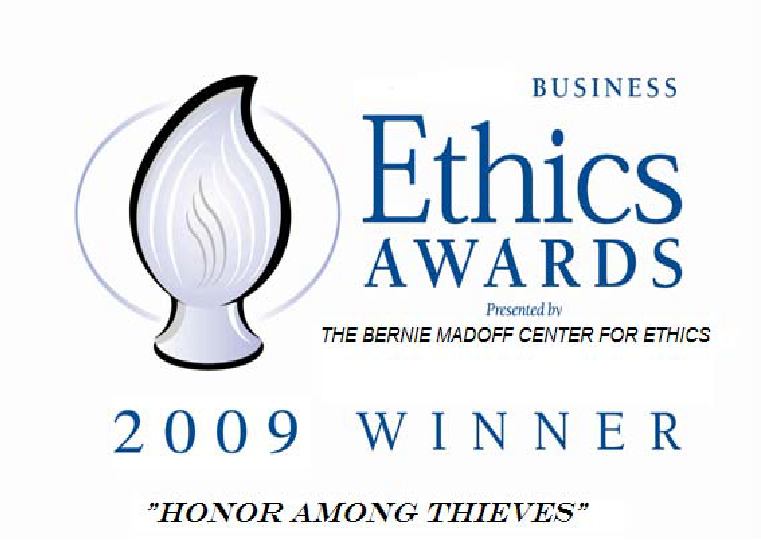 When I raised doubts about the developer’s intentions, the loan officers dismissed them, pointing out that the developer had just received an “ethics award” from a realtors’ organization. 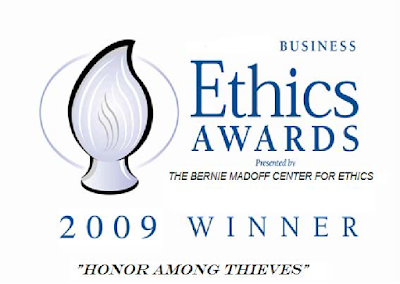 Ethics awards from realtors? What could be next -- a humanitarian award from Osama bin Laden? In any event, the Chief Lending Officer who rigged this deal is now being sued for $300 million by the FDIC (Federal Deposit Insurance Corporation). Eighteenth century philosopher Samuel Johnson once said “Patriotism is the last refuge of a scoundrel.” Let me update Johnson by adding the word “philanthropy” to the list. Some of the best known “robber barons” of the 19th Century (and at least one from the 20th) became philanthropists. My alma mater, the University of Chicago, was founded by one such philanthropist, John D. Rockefeller. Bernard Madoff was also a known philanthropist. Take Richard Simring, for instance, a co-conspirator to Ed Okun, who I mentioned in my international real estate syndication fraud post. Before confessing his guilt, he was also serving as the Chairman of the Board of the Voices for Children Foundation, a charity that raised money to advocate for abused or neglected children, in addition to serving the Lighthouse for the Blind and serving on the board of directors of Educate Tomorrow, a foundation making education attainable to children in the third world nations of Niger and Miami, Florida. Young Irish real estate mogul Darragh MacAnthony dropped out of college to sell timeshares in Spain and ended up founding MRI International, which took funds from UK and Irish investors to buy overseas vacation homes and furnishings. The company was headquartered in Spain and went into liquidation in 2009, and hundreds, if not thousands, lost their cash deposits, for which MacAnthony faces Spanish litigation for “theft by swindle and misappropriation of funds”. He is also chairman of the Helping Hands Group, a charity that provides free transport, training and physical therapy to brain-injured or learning-disabled adults, and chairman of the Peterborough United Football Club. What a nice man. Meanwhile, an “MRI Victim Support Group” of more than 800 members has protested in front of the UK Prime Minister’s House (10 Downing Street). The real estate industry often accommodates such paradoxes. 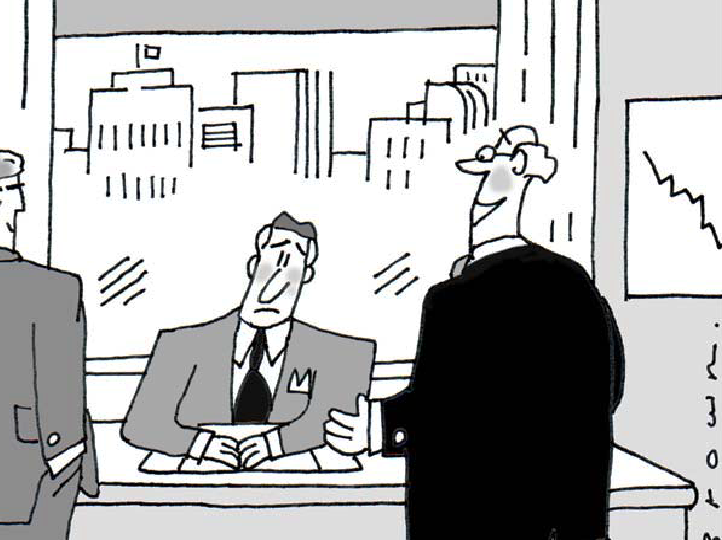 When I was in banking I sometimes had to present the unpleasant news that we had been deceived by a borrower, only to hear an admonishment such as “How dare you question his integrity! Don’t you know he’s chairman of the Pathetic Crippled Children’s Foundation?” Charity and honesty are not necessarily synonymous, and I hypothesize that the biggest crooks often turn to charitable giving to assuage the guilt they feel in receiving ill-gotten gains. Everyone wants to feel good about himself. Cartoon art was purchased from CartoonStock and captions changed. Excellent posting. Undoubtedly you are an expert when it comes to this writing. This is absolutely the first time I went through your post and frankly speaking it succeeds in making me visit here now and then.